Leonela Connolly was one of the runners who participated in our Summer Speed Series on the way to PRing in the fall. She is also a mentor in our half marathon program. For a long time, I have had a strong desire to get faster! But, as it turns out, desire alone was just not enough. To get faster, I needed coaching from experienced runners, structured speed workouts, and an environment that catered to speed seeking enthusiasts like me. I had all of that with the speed training program at Fleet Feet Sports Raleigh. The experienced coaches motivated (pushed) us through structured workouts that included track repeats, tempo runs and (the oft dreaded) hill workout. They also guided us through proper stretching, good running form drills including lean, cadence, and turnover recommendations. They also included core workouts after each speed session which I've come to believe is an absolute requirement for fast, injury free running. The fact that we could share our pain/joy/competitiveness with other participants made the program even more effective, certainly more effective than haphazard speed work (barely) done on my own. Fleet Feet's speed sessions helped me get to a faster mile, an entire minute faster, and to be able to sustain speed for many miles. I improved my running form and learned how to run more efficiently and without injury, all critical for running a faster marathon. It also helped that I borrowed the coaches' track workouts to use on my own after finishing the program. The end result was exactly what I was after, what desire alone would not deliver. 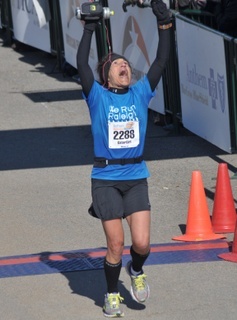 I ran a personal best and qualified for Boston at the Richmond marathon. My new personal best is over a minute faster than my previous best and my BQ time is almost five minutes under the qualifying time for my age group. I am sure that Fleet Feet's speed session was a critical factor in how wildly wonderful my running story has become this year. I highly recommend the speed training program at Fleet Feet Sports Raleigh, it makes a difference!